Skillet Cheesy Chicken and Veggie “Rice” made with riced broccoli and cauliflower, sauteed chicken and cheddar cheese. It’s so fast and easy to make! I whipped this up for dinner the other night and my daughter loved it! I knew I had to share. 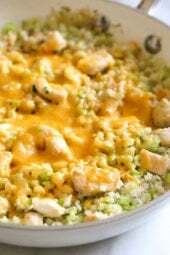 More cauliflower rice recipes you may like are Skillet Cauliflower “Arroz” con Pollo, Skillet Taco Cauliflower Rice, Cauliflower Rice Chicken Biryani, and King Crab Cauliflower Fried Rice. When I was a kid I hated broccoli until I tried it with cheese, then I was hooked and used to eat it every time we had leftover broccoli. As an adult, I still love the combination. This dish took less than fifteen minutes to make. I had a bag of this frozen broccoli-cauliflower riced veggies from Green Giant, and some chicken and I knew this would be a winning combo. This would work fine with any type of riced veggie, although I personally think the broccoli made the dish. If you can’t find riced broccoli or cauliflower, you can also make it yourself by pulsing peeled broccoli stems and cauliflower florets in small batches in a food processor until is resembles rice. You can easily double this for four and make it in a larger skillet. Everyone in the fam loved this! Usually I only rate recipes if I’ve made it exactly as written, but I did embellish this recipe a little based on earlier reviews. I used way more garlic powder, pepper and garlic than the recipe stated. Also, I sprinkled on creole seasoning and adobo seasoning on the veggie rice as it was cooking, before putting the chicken back in the pan. I also cooked the veggie rice longer than stated, so there was a little browning on the cauliflower and broccoli. Usually I don’t care for cauliflower rice, but this was DELICIOUS! Maybe the addition of the broccoli helped my taste buds. My daughter already asked if she could have this in her lunch tomorrow; she said it’s one of her new favorites. I definitely needed to double the recipe to feed four of us. What pans do you use? I came across SkinnyTaste a few months ago. Next week’s meals will be all SkinnyTatste! I made this tonight and used all ingredients except the chicken. I am a vegetarian and used Gardein Crispy 7 Grain Tenders. Came out amazing! Quick question – i couldn’t find the riced cauliflower / broccoli mix so just got the riced cauliflower and then a separate bag of frozen broccoli florets… could i just toss in the some of the frozen broccoli florets as i’m cooking the rice in the skillet or do i need to put in food processor? really trying to cut out time / my family likes broccoli so fine with big chunks of broccoli in it. thanks so much in advance! i found this to be a little too dry, and missing something. So, I added about 1/4 cup of salsa verde, about 1/4 cup of cream cheese, and about 1/4 cup of sour cream. I added about 6 oz of cheddar cheese, shredded, and poured it in a casserole dish and now have it in the oven. it looks so good! Next time, I plan on making a creamy, garlic sauce and pouring over it, instead. YUM! Thanks for the recipe. LOVE this idea because cheese! I made my own cauliflower rice using the cilantro lime cauliflower rice recipe and added in tomatoes and jalapenos. Also added hot Mexican chili powder to liven up the chicken. Overall, great recipe! I made this recipe on Saturday using fresh riced broccoli and cauliflower that I riced myself in my food processor. It was good, but it needed something. Not sure what. Maybe some light alfredo sauce? I will make it again but maybe just the veggies as a side to chicken or something with more flavour. It certainly was fast and easy which I appreciated. I doubled the recipe, in Canada so far we only have 2 kinds of gr even giant Riced veggies we have cauliflower and cauliflower medley (which has peas and bits of carrot) I used one bag of each type. I was skepticism because it is so simple but it is delicious! I would make this every week!! I don’t miss the carbs one bit. Thanks so much Gina! Delicious, easy and fast! I used a 12oz bag of fresh broccoli and cauliflower (instead of the frozen) and used my food processor to rice it. Didn’t like quite like rice, but it still tasted good. I also added sauteed mushrooms. Definitely a make-again dinner! I read the feedback about it being bland so I added more garlic powder and some red pepper. I also used shredded chicken I had made in the crockpot. I just added it at the end before the cheese. I liked that consistency better. I had tried riced cauliflower before and didn’t like it at all, but this was good! Will definitely make it again, maybe add some zucchini towards the end. It’s my favorite vegetable. This was a great dish! My kids didn’t even realize that the “rice” was actually a vegetable. The cheese makes all the difference. I enjoyed it as well and so did my husband. Would recommend for picky kids! I loved this. Just as easy and satisfying as the old children, rice and mushroom soup, only so much healthier and even more delicious. Thank you! This was delicious and such a quick, inexpensive meal that is pretty comforting. Adding to the rotation! This was an excellent recipe – easy and delicious. I see a few people complaining it was bland. Add seasoning! I added a bit more garlic (garlic lover!) and red pepper flakes for some heat. Other than some additional seasoning I followed the recipe. I shared this recipe with all my friends! Definitely a keeper. This website has changed my Weight Watcher life. I love to cook and try new recipes. Thank you so much! Just made this after joining WW a couple weeks ago. I love to cook so Im constantly trying to find healthy but delicious recipes. This totally hit the spot, SOOOO good THANK YOU! You should not use microwave for cooking veg as it takes out vitamins and minerals! – just steam for 10 mins comes out perfect – best way. – eat Colli or Broc raw too in salads yummie. The veggies are not in the microwave that long. It saves time. 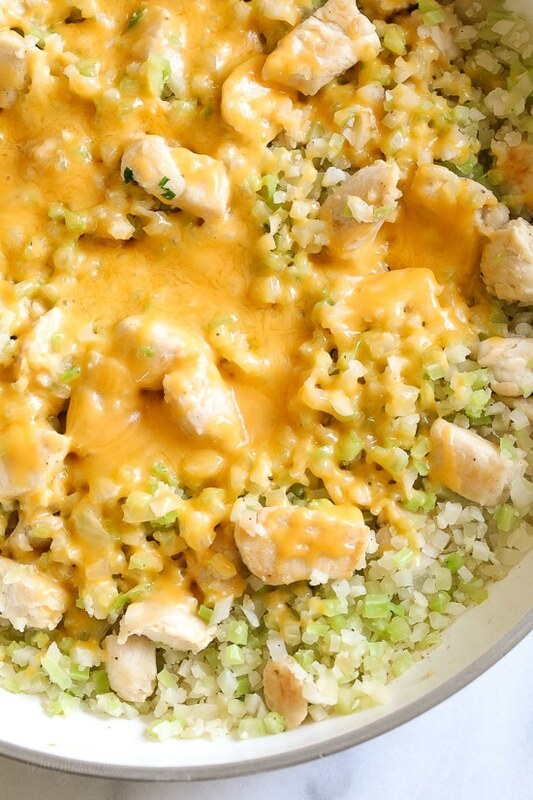 I showed this recipe to my husband and he said…no……but I had some leftover cubed, cooked chicken in the freezer from a different recipe, and I had the green giant cauliflower, broccoli rice in the freezer too. I needed a quick dinner, and had all the ingredients in the house…so….I made it about a month after I had initially shown it to my husband and it was a HIT!!!!!! 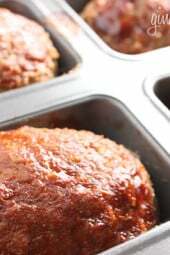 He loved it, I loved it and now, it will be one of our go to quick meals when I don’t have time to fuss with dinner. Best part is the serving size…perfect for just the two of us. 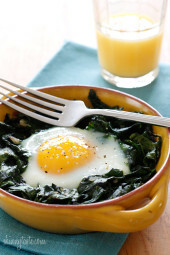 Thank you for this really good, easy, and healthy recipe. The recipe also has a lot of flexibility with other ingredients used in addition to the broccoli, cauliflower rice. Thanks again. I have to say, I couldn’t love this… I tried. I think the broccoli was really overwhelming. the chicken came out great. I just didnt love the dish! Absolutely foolproof Gina! I doubled the chicken and cheese but forgot to double the other ingredients but it still turned out delish. Very easy and fast to make. Kids requested this to go in our normal rotation. Love it when it’s kid approved! Cannot find the riced cauliflower/broccoli blend anywhere, just the riced cauliflower. I bought a bag of chopped broccoli to substitute in instead. How much do you suppose I should use for the same outcome of this recipe? I would estimate 6 ounces of each. Oh, how I wish your site included a barcode for each recipe so I could add it more easily to my WW app. I made this Tuesday and doubled it to have leftovers for lunch/dinner the rest of this week. Definitely delicious, and for some reason even more so today when I had it for lunch! Maybe the flavors soak into the veggies a little more? Anyway, so delicious, and SO easy. This may be my new no-brainer weeknight meal! So awesome, I am glad to hear! Gina, I normally love your recipes, but I have to say that both my husband and I thought this was bland and dry. First time trying riced cauliflower & we are not impressed. It really did’t have much taste at all. P.S. I’m kind of a lousy cook, Gina, but your books and website have given me a lot of confidence. I want to eat healthier, and your recipes are very detailed, which I need. When you say, sautée something, then you always follow up with approximate minutes. I need that! You’re pretty specific, and that’s really helpful to a lousy cook like me. My husband said that he likes all of food from that skinnytaste lady! I just made this recipe today, and I LOVE IT! I’ve never had the riced brocc/cauliflower. Actually, our store was out of it, which I think is a good sign. However, they did have the Riced Veggies Cauliflower Medley, so I bought that. It turned out great! We’re campers, and this would be great to take camping as all I’d have to do is heat it up in the microwave. Any suggestions for making it vegetarian? Shrimp maybe? Another homerun Gina!! 🙂 We are a low-carb household and always looking for new ways to substitute vegetables for pasta/rice. This was perfect! The only thing I added was Caribbean Jerk seasoning to the chicken for a little kick. Other than that, no modifications needed. And who knew Green Giant made the Riced Vegetables already prepared?!?! So much easier!! I will definitely be making this again. Hi! I just wanted to clarify the saturated fat. There is no number listed, does that mean it is 0? Thanks for clarifying! I made this last week and my husband and I both LOVED it. Will be making again tonight for dinner! Another hit by Skinnytaste, thank you! We seasoned the chicken with ranch dressing mix and put some Frank’s Red Hot on this–what a yummy (albeit less healthy) extra kick! I skinnytaste obsessed, however this recipe fell flat. Very bland! Actually most of my family didn’t eat half their plate and instead opted for lunch meat sandwich. This was sooo good & quick!!! Even the hubby liked it and I was skeptical about that! I added some leftover shredded carrot I had from making the Asian peanut noodles earlier this week and three in some green onion as well. I even over-riced the broccoli-flower but it still turned out well! I’m never disappointed when trying your recipes. 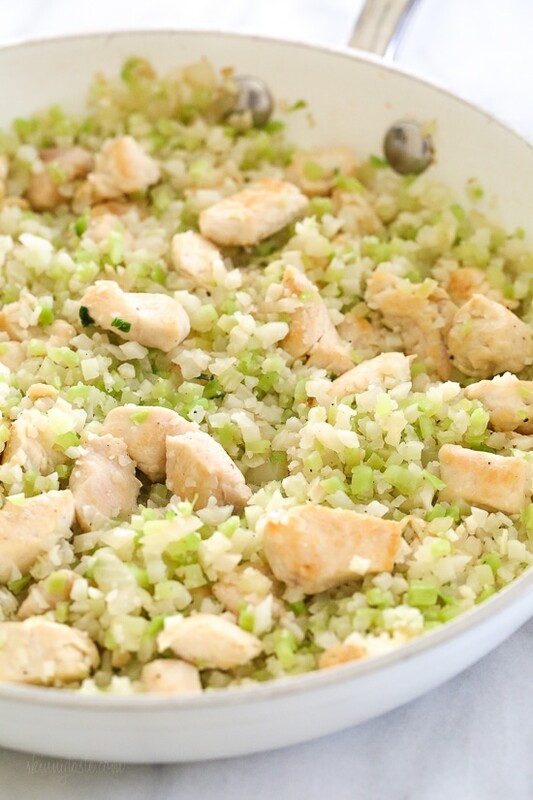 While I’m not a fan of riced cauliflower , or cauliflower in general this was actually good! . My 21 month old daughter devoured it! I made last night and my 6 yr. old picky eater had seconds. I used 3 bags of the Kroger frozen cauliflower/broccoli veggies. Had my 9 yr. old put in the food processor and rice ourselves. The ‘rice’ part was the best. Only change, I did was add oil while browning the rice. The extra voo seems to make a difference when making cauliflower rice I’ve noticed. This was a keeper. Love that it was comfort food without packing on the pounds! 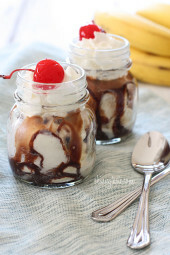 I just loved this recipe! It was fairly simple and so delicious. I wanted to let you know that I’ve been religiously checking your website and using your recipes for over 2 years now. That’s when I started weight watchers. I’ve lost 164 pounds and you deserve some of the credit because your recipes have taught me that good food doesn’t have to be bad for you. Thank you so much. I was disappointed with this recipe. Surprisingly bland for a SkinnyTaste recipe, which I usually love. You can always add any seasoning you like. Did people really “love ” it, or are people trying to not hurt Gina’s feelings? This was pretty good. Having said that, I don’t feel it was up to par with the majority of SkinnyTaste recipes, which I generally love. I am glad that my preschooler had a good serving of vegetables, but as an adult it was pretty darned bland. There was nothing special, no oomph. It was fine, but sadly nothing more. Great dish. I’m wondering whether you’re responsible for 3 stores in St. Louis being out of the Green Giant Riced broccoli/cauliflower combo with the manager lamenting he can’t keep it stocked! “Flies off the shelves” he said. (They have plenty of plain and a cauliflower/sweet potato combo). I think your recipe played a part in the cauliflower/broccoli flying off the shelves???? This was a win for an easy weeknight meal. I used green giant’s riced cauliflower + sweet potato (couldn’t find the broccoli mix). It was good, even my picky toddler approved! This is a great base that I will make again and add to, probably with additional chicken and maybe other veggies. I made this with fresh “riced” cauliflower and broccoli florets, and the texture was actually really good. The flavor was a little flat; next time I might some crushed red pepper flakes. Thanks Amber! Glad you enjoyed it! Tonight’s supper — and tomorrow’s lunch– was and will be delicious thanks to this new gem from my cooking hero! I had to hunt at three grocery stores to buy the riced broccoli and cauliflower. Next time, however, thanks to Gina’s great suggestions in past posts, I will rice the fresh veggies myself –SO EASY! — to make this delicious dish even better. This recipe will be in my regular rotation. Cooking the chicken in two batches is key. I made this tonight and my whole family enjoyed it. I am always looking for carb free dinner ideas. This Green Giant product isn’t available in Canada. Could you add directions for fresh veggies? I made way too much and wasn’t sure if I should cook the veggies before putting them in the food processor. Thanks for abother great dish! You put them in the food processor raw. I have other recipes here that show how to make it, look for the cauliflower fried rice. Thanks! I had the leftovers reheated with a little goat cheese this week, super delish! SLAM DUNK! So easy to make, it was delicious, and leftovers heated well! Perfect meal for my picky 1 year old, and mom and dad enjoyed as well. Thank you! Made this for dinner tonight and it was delicious! Your recipes never disappoint! I made this for my family this evening and it was tastey. I am trying to cook healthier meals since my husband was diagnosed with heart failure, I substituted salt with Mrs. Dash seasonings. Made this for dinner and my husband loved it! I added some fresh mushroom in since I had some on hand. I love that it came together so easily and quickly. Does anyone know if/ where Green Giant riced vegetables can be found in Northern California? I have looked at Safeway and Lucky’s. Check the Green Giant website. Enter your zip code on the “Where to Buy” tab to find stores near you. Made last night and loved it. Used fresh riced cauliflower and a broccoli/carrot mix because that’s all they had at the store, and it worked well. I’d say maybe double the chicken to make it more filling, because I was hungry a few hours later! Otherwise, it was great and so easy. Will make again! Definition adding this to our menu for this coming week! I really wish we had the green giant riced veggies in Canada, it would make things so much easier! I tried your recipe for lunch today and it was yummy! I’m usually a carb lover but trying to cut back. This really hit the spot, especially with the the added cheese. It was super easy to make. I only used riced cauliflower bc that’s all I had on hand but I’m sure it’s even better with the broccoli added bc I love it. BTW I use your site 99.99% of the time for our lunches and dinners! I made this last night for my wife and me and we absolutely loved it!!! Thank you!!! Gina- what do you think about substituting ground turkey for the chicken? I absolutely love all your recipes and refer all my friends and family to your website! You should create an app! ???? I think you meant add the 1/2 pound of chicken or do you cook the chicken in two batches? I feel like 8 ounces would fit in a skillet at one time. This sounds delicious! I have used the riced cauliflower before and now will look for the broccoli cauliflower combo. Thank you !! Gina, in Step 2, it says to add HALF the chicken. I don’t think you meant that, there’s plenty of room in a large skillet for a half pound of chicken (even for a pound of chicken, if you’re doubling, from my experience. I’m loving riced vegetables right now, and am eager to try this recipe! I’m obsessed with your Skillet Cauliflower Arroz con Pollo, and also loved the Cauliflower Fried Rice with Ham. Thank you!!!! The chicken should be in fairly small pieces–cubes– so you would need to put in half at a time in order to give each cube enough space to brown and not just steam and turn white. Do you add the cauliflower/broccoli frozen or follow package instructions and cook it separately first? I found riced broccoli to be stronger than cauliflower rice in taste. When I pre-cooked it in the microwave for a few minutes, it mellowed and blended better into the dish I was making. I didn’t know there was a cauliflower-broccoli blend and am going to add it to my list. We love the riced veggies. For my husband, I sometimes add brown rice to a dish and he’s perfectly happy. This recipe is going on my list for this coming week. Thanks, Gina. I love riced cauliflower and use it all the time, either homemade or pre-riced at the Grocery store. When I heard Green Giant had a frozen option and it was a little less expensive, I thought why not try it? So we did. And then I remembered why I no longer eat canned or frozen veggies (other than corn and peas). YUCK. yuck yuck yuck can’t say it enough. There wasn’t enough salt or pepper in the world that could save it, at least not when you microwave or steam it like the package suggests. I had tried the cauli/sweet potato combo but still have a package of the broccoli/cauli rice and will try to use it by just sauteing and not steaming, which is what I assume you mean in this recipe. On another note, we’re in love with their cauliflower tots, so I’m happy those are a hit! I’ve found the best way to cook the frozen riced cauliflower is to put it in a dry pan and let it saute, stirring every once in a while, until all the moisture has cooked off and its all heated through. I like using frozen over fresh when I want the veggie taste to be more subtle. 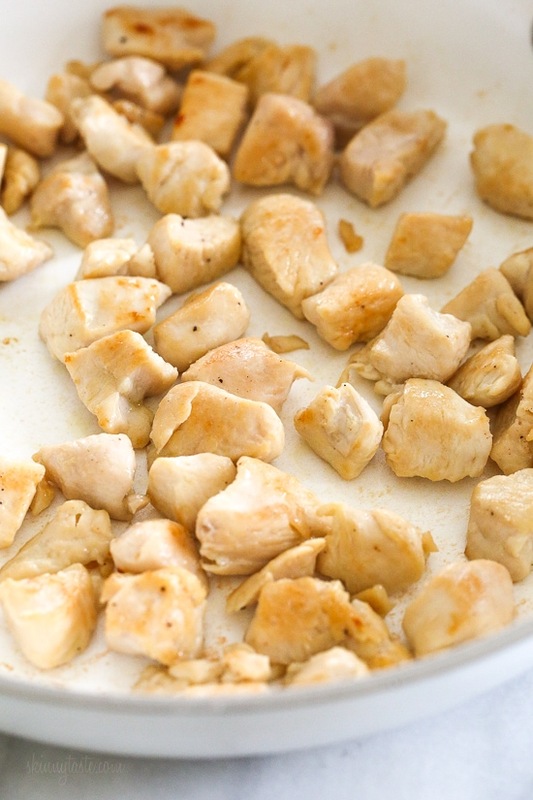 Could you do this with ground chicken – Brown and remove….? Do you put the veggies in frozen?